Speaker Gloria Macapagal Arroyo hosted Tuesday senatorial candidates of the Hugpong ng Pagbabago in the hometown of her sister-in-law in Negros Occidental where the latter is running for the House of Representatives. THE SPEAKER SPEAKS. In vote-rich Negros Occidental, Speaker Gloria Macapagal Arroyo hosts Tuesday senatorial candidates of the Hugpong ng Pagbabago with campaign manager Davao City Mayor Sara Duterte-Carpio in the hometown of the Speaker’s sister-in-law, Marilou Arroyo, where the latter is running unopposed for a seat in the House of Representatives. “When I saw the schedule of Hugpong, I’ve seen that they don’t get a rally yet here. Since my sister-in-law is a candidate in the fifth district, I said maybe we can invite them. Of course, they accepted it. 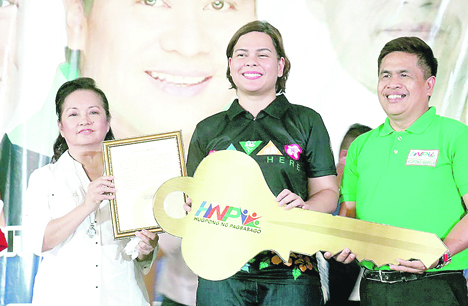 Negros Occidental is a very big province... It’s really for the Hugpong candidates to introduce themselves to the people of Negros Occidental,” she told reporters during her visit to Teleperformance Bacolod City, the first BPO company in the Visayas region which she inaugurated in 2006. Arroyo’s sister-in-law, Marilou Arroyo, is running unopposed for the fifth congressional district of Negros Occidental. After visiting her Roll-on-Roll-off ports and urban poor housing projects, Arroyo continued with her “sentimental journey” by going to the first BPO office in the Visayas region. “Like what we did the last time, I want to go to my favorite projects. Of course, developing the BPO industry was one of my proudest accomplishments and I remember this was a first in the Visayas when we opened it here. That’s why we visited again in 2010 when I was reviewing my projects,” she said. It is expected to grow to 1.7 million in the coming years accounting to 10 to 15-percent share of the global market share.